Have we ever met someone who lived a different kind of life, who showed us a better way of being human? 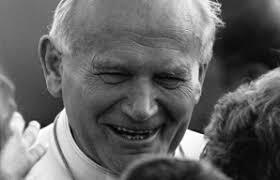 For example, when St. John Paul II was a priest and professor in Poland, his classes were packed because everyone wanted to hear him speak. Flocks of people went to him for advice, and it’s unanimously said that he was a different kind of person: deeply human, full of life and laughter, but always thinking and pensive. He didn’t waste time on frivolous things, but focused on the most important things: God, prayer, asceticism, relationships, philosophy, etc. He showed immense respect for people by listening, and disciplined himself by fasting, wearing worn-out clothes, and giving away what he didn’t need; but he also knew how to enjoy life truly. As pope, millions testify to the power of his presence, words and teaching, the depth of his soul, and his power to touch ours. He took life seriously and dedicated himself fully to God’s plan. Have we ever met someone like this? A Catholic school teacher once told me that when she took her Grade 7s up to Westminster Abbey, they were in awe of P. Abbot, because he lives a better kind of life: He’s real, human, and deeply religious. God speaks to us through these encounters and says, “I want you to have this kind of life!” So, how do we receive this gift? This is the implicit question the man in the Gospel today asks when he encounters Christ, and we’re going to follow what St. John Paul II says about this encounter. Whenever I read his commentary, something inside me comes alive: I want to have that fullness of life! Christ is the answer! “A man ran up and knelt before him” ( Mk 10:17). St. John Paul says this man represents every person who goes to Jesus and questions Him about the full meaning of life (Veritatis Splendor, 7). Everything we do, deep down, tries to answer his question, “Good Teacher, what must I do to inherit eternal life?” (Mk 10:17). 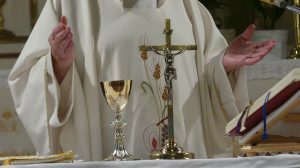 This “is the essential and unavoidable question for… every man, for it is about the moral good which must be done, and about eternal life” (VS, 8). And why does he go to Jesus? St. John Paul says it was because he was taken by the attractiveness of Jesus’ person. He now has questions he never had before. This is what we need to do: When we see a better life, we need to draw near to Jesus with our spiritual hunger. When Jesus answers, “You know the commandments: ‘You shall not murder; You shall not commit adultery; You shall not steal; You shall not bear false witness; You shall not defraud; Honour your father and mother’” (Mk 10:19), He’s saying that God’s commandments show the way of life (VS, 12). Our society always talks about being nice and being a good person—but that’s hollow, because there’s no meat to it, and that’s why we get average people of no great character. However, God’s commandments are clear and challenging: love God first, honour our parents, and respect human dignity. People who follow these have a clearer and more human life. Nevertheless, the commandments are still only the starting point (VS, 13). There’s more to the life of perfection (Cf. Mt 19:21). 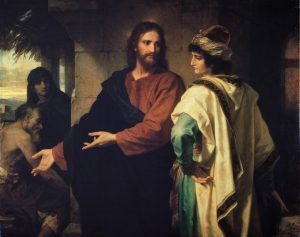 That’s why, when the man says he keeps the commandments, Jesus says, “You lack one thing; go, sell what you own, and give the money to the poor, and you will have treasure in heaven; then come, follow me” (Mk 10:21). And here we come to the heart of the matter: We all desire the life God offers us. But we lack something: We’re still holding back parts of our life from Jesus. “When the man heard this, he was shocked and went away grieving, for he had many possessions” (Mk 10:22). This man had a ‘disordered attachment’ to his possessions. This is a technical spiritual term, meaning he values them too much. In Star Wars, episode II, Anakin says that attachments are forbidden for Jedi. Yet we’d say differently, because there are ordered attachments and disordered attachments. Are we attached to our family? I surely hope so. But I hope not more than God. Let’s focus on disordered attachments to possessions because this is what Jesus talks about today. Possessions are good, but the reality is we live in a materialistic, consumeristic society, right? Most of us, for example, buy things we don’t need. One friend once told me that when she goes shopping, she feels as if she has to buy things. We sometimes may buy totally useless things, just because we want them for a second. Do we ever buy clothes because friends have them? In essence, do we have too many things? In 2005, when I was preparing for priestly ordination, it’s customary to buy vestments that will fit, and have a personal chalice. And there are catalogues for these items, you know. So I started looking through them for hours and when I went to bed, I kept on thinking about them—that’s what we call an obsession. It kept on happening for weeks and then I said, “This is out of control. I’m doing this for the wrong reason.” Since I realized I had a disordered attachment, I decided not to buy anything unnecessary, because I knew I would be doing it more for me than for God. I only bought a set of 4 chasubles because I needed them and that’s it, but I knew my heart was pure about this. 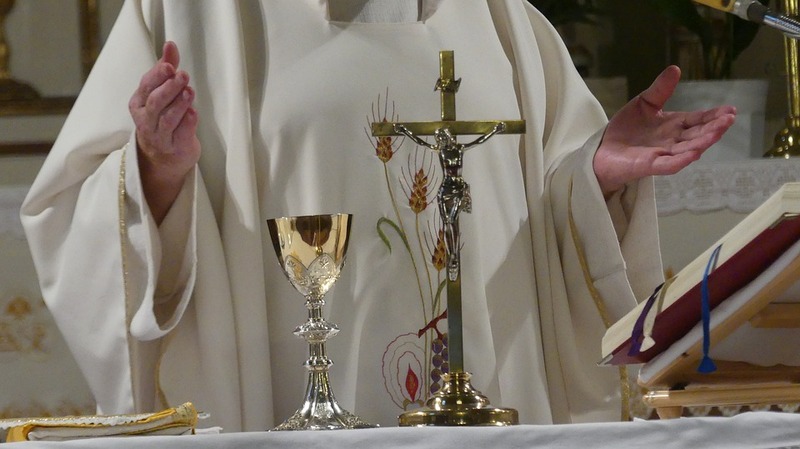 It was only five years later when I realized my heart was ready, and the vestments would be for other people, to remind them that the liturgy is divine worship, that I started buying vestments. And any other priest can use them, even though they always come back somewhat used. Why? Because they’re meant to be used, even though one of the problems with loaning things is that some people don’t take care of them. However, I want to avoid hoarding beautiful things, so I allow it. And when I die, other priests will use them, hopefully priests that God calls from this parish! The greatest danger is that disordered attachments prevent us from following God. We’re not generous with our money. We tend to give from our surplus, the extra, the leftovers, rather than sacrificially giving like Jesus, and giving until it hurts. Some of us are also called to follow God more fully in terms of giving of our time, but sometimes the focus on money holds us back. Our hearts dream about better cars, bigger houses, having the best stuff. Did I ever tell you about the man who himself told me that he was neglecting his family because he loves his work? While some saints had lots of money, the historical truth is that the vast majority of them gave away their money to those in need, because it’s extremely hard to become a saint and have lots of belongings. It’s possible but much harder, and it’s rare. Yes, it is hard to tell the difference between needs and attachments. There are principles, but it often comes down to one’s judgement. This is where honesty comes in. We have to ask ourselves hard questions from the point of view of faith. Yes, we should save up for retirement and our children’s education—that’s good, and I hope our children have the best education possible and you have a good retirement. But what kind of retirement? Remember, we’re not talking today about just being good, but about being perfect. Yes, we can have beautiful clothes and shoes, but how many clothes and pairs of shoes do we need? It’s necessary to have some beautiful things, because beauty is necessary for the soul and reminds us of God. But, please, be careful: Most of us are still more materialistic than we are austere. If you’re going to Faith Studies or Alpha this week, you can always ask your group leader more specific questions. Someone on the Leadership Team said to me, after reading the draft of this homily, “What about your lightsaber? Is that necessary?” Yes, I have an authentic lightsaber, which I use every Halloween to show the elementary students how to dress as a good character. (But such an objection, that is, that because we may not live up to this teaching gives us license not to do it ourselves, is invalid.) So today I gave the lightsaber away. Now, what one thing today makes us feel uncomfortable? Stay there; God is speaking through that discomfort. Could we all this week get rid of one thing we don’t need? Or could we make a sacrificial donation to a charity? Could we not buy something we want? Last year, we talked about only buying things we need for Christmas, or half of the things we want; could we do that? Self-denial is critical here. I believe it was St. Augustine who said if we want to know if we’re too attached to things, then give them up, at least for a while. If we want to know if we’re inordinately attached to our cell phone, look what happens when we give it up for a while. If we’re cranky, we’re too attached. We pray today that our mother Mary intercede for us, that she give us the grace to let go, because it’s so hard for us to let go. Brothers and sisters, it’s really a joy to let go! Because we gain so much. Jesus asks us only to let go of things that can’t really fulfill us. We finish with a video about Thomas Monaghan, the former billionaire owner of Domino’s Pizza, who sold the company to dedicate all his wealth to doing God’s will and start a Catholic university from scratch. Thomas Monaghan now has more than ever before: He has more humanity, love, and character. He loves like Christ; he lives a better kind of life.